The team from The Glass Recycling Company (TGRC) spent their 67 minutes for Mandela Day at Kingsmead College in Rosebank actively repurposing waste materials including plastic bags, newspapers and even recycled billboard materials creating well-insulated, warm sleeping bags for the homeless in the Joburg inner city. The initiative was founded by Franck Leya who is also the founder of a youth activation group concerned with cultivating a sense of self-worth among homeless youth. 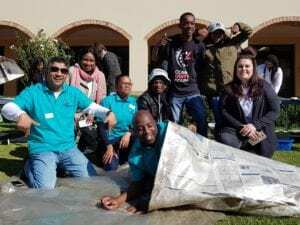 The sleeping bags made on Mandela Day will be used during a SleepOut event in Joburg inner city where the homeless will be taught to make these sleeping bags out of recycled materials. “These simple but warm sleeping bags show creativity at its finest, says TGRC CEO, Shabeer Jhetam, “and we love that recycling can be used in such an innovative way to make a difference in the lives of others while also benefiting the environment. Make every day a Mandela Day and Recycle everyday too,” adds Jhetam. 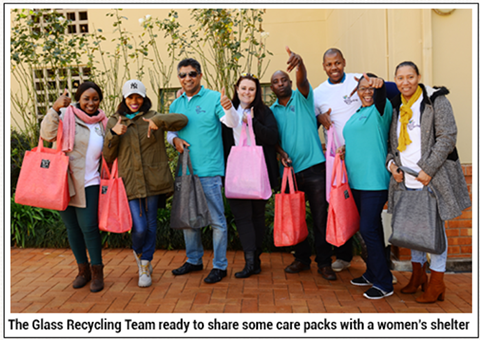 The Glass Recycling Company’s commitment to disadvantaged women did not go unaddressed this Mandela Day. The team got into the spirit of the day last week already and decided to put together much-needed care packs for one of the women’s shelters in Yeoville. Care packs consisted of toiletries and hygiene products, socks and a bar of chocolate.